What are risk factors for mantle cell lymphoma? What are signs and symptoms of mantle cell lymphoma? What types of health care professionals diagnose and treat mantle cell lymphoma? What tests do health care professionals use to diagnose mantle cell lymphoma? What are the stages of mantle cell lymphoma? What is the treatment for mantle cell lymphoma? What are complications of mantle cell lymphoma? What is the prognosis of mantle cell lymphoma? Is it possible to prevent mantle cell lymphoma? Are there clinical trials for mantle cell lymphoma? Mantle cell lymphoma (MCL) is a relatively rare cancer of the lymphoid cells that arises from the outer rim or mantle lymphoid follicle. The cause of MCL is unknown, although around 85% of patients have a genetic abnormality known as a translocation, resulting in the overproduction of cyclin D1, a protein that drives cell growth. The risk factors for MCL are not clear and may be related to environmental or genetic factors. Doctors who treat MCL include one's primary care physician and such specialists as oncologists, hematologists, radiologists, and surgeons. There are four stages of MCL, but health care professionals typically diagnose most patients (70%) after they are in stage IV, the stage with the worst prognosis with MCL spread to other organs. Physicians stage and diagnose MCL by examination of needle aspiration of lymph nodes and/or bone marrow biopsies along with imaging studies. Health care professionals treat MCL with chemotherapy, radiotherapy, and combination methods, which may also include surgical debulking; currently, there is no cure for MCL. Complications of MCL include short lifespan and death; other complications may be due to treatment protocols using chemotherapy. For most individuals with MCL, the prognosis is only fair to poor. It is not possible to prevent MCL. There are ongoing clinical trials for MCL; some reports in clinical trials suggest there may be better outcomes for this disease in the future. NHL is classified into many different types. Several classification systems exist for NHL, including the Revised European American Lymphoma Classification, which is the foundation for the WHO lymphoma classification. The classifications use cell types and defining other characteristics. 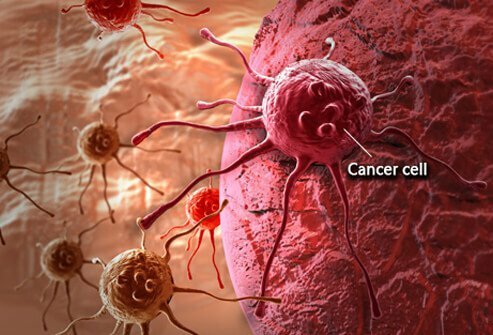 Basically there are three large groups: the B cell, T cell, and natural killer cell tumors. Newer techniques such as immunophenotyping (a way to study the proteins on a cell and identify the precise types of B or T cells that are involved) are used to diagnose and classify lymphomas. This technique is especially useful in the case of B-cell lymphomas. Mantle cell lymphoma (MCL) is a relatively rare type of cancer of the lymphoid cells; it is termed mantle cell lymphoma because the cancer cells (lymphoma cells) arise from the outer rim or mantle of lymphoid cells that surround a lymphoid follicle. MCL is an aggressive B-cell type of non-Hodgkin's lymphoma, and the rare disease accounts for about 2%-10% of non-Hodgkin's lymphomas. About 85% of patients with MCL have a characteristic genetic lesion known as a reciprocal translocation, in which short segments of one chromosome are moved to another chromosome. The characteristic change in MCL involves chromosomes 11 and 14 and is called t(11;14). The exchange of chromosomal material occurs at the location of the cyclin D1 gene (BCL-1, now referred to as CCND1) on chromosome 11; the change causes an overproduction of cyclin D1, a protein that stimulates tumor cell division and growth. This genetic change is considered a driver in the behavior of MCL, which likely works together with other genetic defects to cause MCL. In a small number of patients, t(11;14) is not present. In most of these patients without the characteristic translocation, other genetic changes cause excess production of cyclin D1. There is a lack of agreement in the medical literature on specific risk factors for MCL, although family history and certain genetic changes have been identified that increase the risk. MCL affects males about four times as commonly as females. Blacks and Asians are less likely than whites to develop MCL. Age is a risk factor; the median age of MCL onset is 60 years of age with an age range of 35-85 years. Spread of the cancer into other organs (extranodal spread) may produce organ-specific symptoms. Specialists in cancer treatment (oncologists, hematologists, surgeons, and radiologists), in conjunction with one's primary care physician, treat mantle cell lymphoma. Health care professionals diagnose MCL with needle aspirates of lymph nodes and determine staging by needle aspirates or biopsies of bone marrow. CT, blood tests, and immunotyping (examining the specific molecules expressed on the surface of the lymphoma cells) of cancer cells may be done to further delineate spread and other characteristics of your MCL. Testing for overexpression of the cyclin D1 protein and for the presence of the t(11,14) genetic abnormality are also performed. There are four stages of mantle cell lymphoma. Stage I and stage II describe localized MCL. Many patients are seen by physicians in stage III (intermediate-grade or stage) in which the MCL cancer cells have begun to proliferate outside of the nodes, and 70% percent of patients are first diagnosed in stage IV (advanced-stage) in which the cancer cells have gone into masses, often replacing lymph nodes and have spread into other body organs. Treatment of mantle cell lymphoma is difficult because patients usually receive their diagnosis in stage IV, where the MCL has advanced throughout the body. There are many different therapeutic regimens (single-agent and combined drugs) to treat MCL; most include multiple chemotherapy drug administrations (for example, high-dose Ara-C and others). Rituximab (Rituxan), in combination with other chemotherapy drugs, typically treats patients who have MCL. Rituxan is a monoclonal antibody used to treat different cancers of the lymphoid cells. Newer chemotherapy drugs used for MCL include bortezomib (Velcade). Other treatments include autologous stem cell transplantation and R-hyper-CVAD (rituximab hyper CVAD), a more intensive form of chemotherapy (drug intensified chemo-immunotherapy) and R-DHAP chemotherapy for refractory mantle-cell lymphoma. Some patients may benefit from surgical debulking (removal of tissue to reduce symptoms). There is no cure for MCL; health care providers administer treatments to reduce symptoms and/or to increase limited survival time. Patients should speak with their physician team members to decide what treatment options are best, as there are new specialized drug treatments and protocols continually appearing in the medical literature. For example, ibrutinib (Imbruvica) is a new formulation (one pill per day) that patients who have obtained at least one prior therapy can use. MCL has a poor prognosis, even with appropriate therapy. Usually, physicians note treatment failures in less than 18 months, and the median survival time of individuals with MCL is about two to five years. The 10-year survival rate is only about 5%-10%. However, some researchers claim to have doubled the median survival rate in younger patients (less than 65 years of age) treated with an intensive regimen of chemotherapy in clinical trials. Currently, there is no known way to prevent the genetic changes that drive MCL. Yes, there clinical trials for mantle cell lymphoma. For example, an open-label phase 2 trial of several drugs, alone and in combination in treatment for refractory mantle cell lymphoma found evidence that a triple combination of drugs warrants evaluation. For further information and a list of those trials and their locations, please visit https://www.centerwatch.com/clinical-trials/listings/condition/628/mantle-cell-lymphoma. Abbasi, M. "Mantle cell lymphoma." Medscape. Feb. 11, 2018. <http://emedicine.medscape.com/article/203085-overview>. Kluin-Nelemans, H., et al. "Treatment of Older Patients with Mantle-Cell Lymphoma." NEJM Aug. 9, 2012. <https://www.nejm.org/doi/full/10.1056/NEJMoa1200920>. Lowry, F. "Cure for mantle cell lymphoma within reach says expert." Medscape. Jan. 19, 2016. <https://www.medscape.com/viewarticle/857424>. Wang, Yu, and Shuangge Ma. "Risk Factors for Etiology and Prognosis of Mantle Cell Lymphoma." Expert Rev Hematol 7.2 April 2014: 233-243. <https://www.ncbi.nlm.nih.gov/pmc/articles/PMC4465399/>. What are superfoods? Learn about super foods for weight loss. Test your superfoods IQ with this online quiz featuring the top, best, heart-healthy, weight-friendly, fruits, vegetables, drinks, and other foods that are available at your fingertips. Please share your experience with mantle cell lymphoma (MCL). What is your MCL prognosis? What treatments have you received for mantle cell lymphoma (MCL)? Both Hodgkin's disease (sometimes referred to as Hodgkin's lymphoma) and non-Hodgkin's lymphoma are cancers that originate in a type of white blood cell known as a lymphocyte, an important component of the body's immune system. The peripheral blood stem cell transportation technique involves using stem cells from a patient's blood for a bone marrow transplant. Stem cells can be used to repopulate the whole bone marrow and grow new blood cells. Chemotherapy and/or radiation are used to kill diseased blood cells before a bone marrow transplant. The treatment does not involve surgery, but is nevertheless a form of transplantation.